1. Following the Report of the Financial Reporting Council of Nigeria on the Audited Financial Statements of the Central Bank of Nigeria (CBN) for the year ended 31st December 2012, and other related issues, I write to convey to you His Excellency, Mr. President’s decision that you be suspended from office as Governor of the Central Bank of Nigeria with effect from Thursday 20th February 2014. 2. The decision is predicated on the loss of confidence in your ability to lead the Apex Bank towards the achievement of its statutory mandate. Of particular concern is the fact that, under your watch, the bank has carried out its functions in a manner characterised by disregard for due process and accountability. 3. This is exemplified by various acts of financial recklessness and unprofessional conduct which are inconsistent with the administration’s vision of a Central Bank propelled by the core values of focused economic management, prudence, transparency and financial discipline. (a) By virtue of Section 15(1) (a) of the Public Procurement Act, the provisions of the Act are expected to apply to all ‘procurement of goods, works and services carried out by the Federal Government of Nigeria and all procurement entities.’ The definition clearly includes the Central Bank of Nigeria. (b) It is however regrettable the Central Bank of Nigeria under your leadership, has refused and/or neglected to comply with the provisions of the Public Procurement (PPA). You will recall that one of the primary reasons for the enactment of the PPA was the need to promote transparency, competitiveness, cost effectiveness and professionalism in the public sector procurement system. (c) Available information indicates the Central Bank has over the years engaged in procurement of goods, works and services with billions of naira each year without complying with the express provisions of the PPA. (d) By deliberately refusing to be bound by the Provisions of the Act, the CBN has not only decided to act in an unlawful manner, but also persisted in promoting a governance regime characterised by financial recklessness, waste and impunity, as demonstrated by the contents of the 2012 Financial Statements. 6. No responsible government will tolerate this blatant disregard for its laws and procedures by any person or institution. The Central Bank, by its unique position, ought to show good example and be the leading light in the promotion of the culture of observance of due process. (a) The unacceptable level of financial recklessness displayed by the leadership of the Central Bank of Nigeria is typified by the execution of ‘Intervention Projects’ across the country. From available information, the Bank has either executed or is currently executing about 63 (sixty-three) such projects across the country. Please find attached hereto as Annexure I, a letter dated January 7th, 2014 from the CBN confirming the list of projects across the country to which the CBN has committed N163 Billion (One Hundred and Sixty Billion Naira). (b) It is inexcusable and patently unlawful for any agency of Government to deploy huge sums of money as the CBN has done in this case, without appropriation and outside the CBN’s statutory mandate. It is trite that the expenditure of public funds by any arm of government must be based on clear legal mandates, prudent costing and overriding national interest. (c) Cognisant of the attendant negative consequence of the CBN’s action, a review of the Central Bank (Establishment) Act 2007 does not disclose any legal basis for the huge expenditure on intervention projects in default of appropriation. 8. Financial Infractions and Acts of Financial Recklessness Committed by the Central Bank as reflected in its Audited Financial Statements for 2012. (a) Pursuant to Section 50 of the CBN Act 2007, a copy of the Audited Financial Statement of the Central Bank for the year ended 31st December 2012 was sent to Mr. President (Please, find a copy attached hereto as Annexure II). 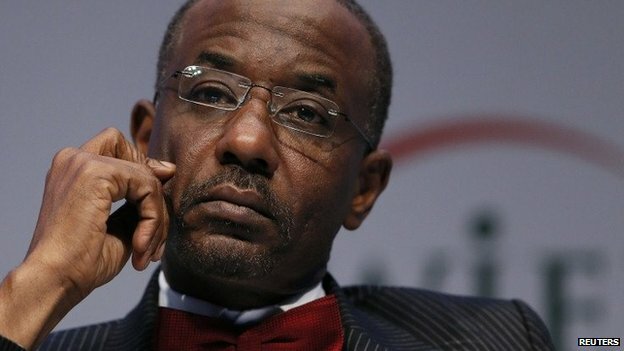 Based on the issues raised in the financial statement, a response was requested from Sanusi to enable a proper appreciation of the nation’s economic outlook. (Please, find attached a copy of the letter dated 4th May, 2013 as Annexure III). (b) Your response to this query (Annexure IV) was further referred to the Financial Reporting Council by a letter of 12th April, 2013, for review (Annexure V). The review of the Financial Reporting Council of Nigeria, rather than allay the fears of Government, further confirmed concern about the untidy manner in which you have conducted the operations of the CBN (Annexure VI). (a) In a most ironical manner, it has become obvious that the CBN is not able to prepare its financial statements using applicable International Financial Reporting Standards (IFRS) whereas Deposit Money Banks that the CBN is supervising have complied with this national requirement since 2012. Undoubtedly, this laxity on the part of our apex bank, apart from calling to question its capacity for proper corporate governance, is capable of sending wrong signals to both domestic and international investors on the state of the Nigerian economy. (b) The provisions of the Memorandum of Understanding (MoU) signed by the CBN and other Deposit Money Banks (DMBs) on Banking Resolution Sinking Fund have been breached in a material manner. For example, a Board of Trustees (BOT) to manage the Fund has not been constituted since 2010 when it was established. The CBN has however continued to utilise the Fund for certain operations without the approval of the said BOT. (c) Contrary to Section 34(b) of the CBN Act 2007 which provides that the CBN shall not, except as provided in Section 31 of the Act, inter alia, purchase the shares of any corporation or company, unless an entity set up by the approval of the authority of the Federal Government, CBN in 2010, acquired 7% shares of International Islamic Liquidity Management Corporation of Malaysia to the tune of N0.743 Billion. This transaction was neither brought to Mr. President’s attention nor was a Board approval obtained before it was entered into. (d) The CBN has failed or refused to implement the provisions of the Personal Income Tax (Amendment) Act 2007. Accordingly the Pay-As-You-Earn (PAYE) deductions of its staff are still being computed in accordance with the defunct Personal Income Tax Act 2004, thus effectively assisting its staff to evade tax, despite the generous wage package in the CBN, relative to other sectors of the economy. (iv) While Section 6(3) (c) of the CBN Act 2007 provides that the Board of the CBN is to make recommendations to Mr. President on the rate of remuneration to Auditors, the Bank has consistently observed this provision in the breach and even went to the extent of changing one of its Joint External Auditors without notifying the office of the President. (g) It is significant to note that the external audit revealed balances of sundry foreign currencies without physical stock of foreign currencies in the CBN Head Office. 11. The above issues are only few of the infractions highlighted by the review and which point to the gross incompetence and recklessness which characterised the operations of the CBN in the period under review. 12. In light of the foregoing, and pursuant to the provisions of Section 7 (2) (a), Section 8 (1) (k), Section 62 (1) (c) and 62 (3) of Financial Reporting council of Nigeria Act, a copy of this letter is being forwarded to the Executive Secretary of the Council for his notification and further necessary action with a view to addressing the urgent need to reposition the bank for the effective discharge of its statutory mandate. 13. You are, by this letter, directed to hand over to most senior Deputy Governor, Dr. Sarah Alade who will act as Governor till the conclusion of the investigation into these far reaching breaches. Please accept, as always, the assurances of my highest regards and esteem.